Nutanix and Citrix have partnered to create a tightly integrated multi- cloud solution that simplifies and accelerates VDI deployments for companies of any size. With Nutanix InstantON for Citrix Cloud, the entire Citrix software stack is delivered as a 1-click service from the Citrix Cloud, attaching with zero effort to the on-prem Nutanix clusters powered by Citrix XenServer or AHV, the Nutanix native hypervisor. This hybrid mode tackles all the drawbacks of an exclusively on-prem or an exclusively cloud-based desktop delivery mechanism. The benefits of a modern digital workspace are well documented; but not all solution stacks are created equal. Join Nutanix EUC Technical Director, Kees Baggerman and Dave Brear,Enterprise Architect, Citrix Professional Services, as they discuss how Citrix EUC with Nutanix Files, which is natively integrated into the Nutanix Enterprise Cloud OS, eliminates costs and complexities at any scale to successfully deliver a modern digital workspace. 1. What is Nutanix Files? 2. Why is Nutanix Files applicable to Citrix EUC environments and its successful deployment? 3. Best practices to integrate and deliver Nutanix Files in Citrix EUC environments. 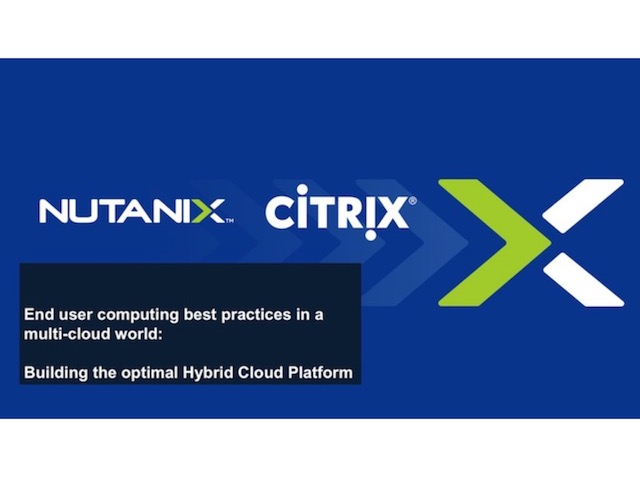 Nutanix and Citrix have partnered to create a tightly integrated hybrid cloud solution that simplifies and accelerates VDI deployments for companies of any size. With Nutanix InstantON for Citrix Cloud, the entire Citrix software stack is delivered as a 1-click service from the Citrix Cloud, attaching with zero effort to the on-prem Nutanix clusters powered by Citrix XenServer or AHV, the Nutanix native hypervisor. This hybrid mode tackles all the drawbacks of an exclusively on-prem or an exclusively cloud-based desktop delivery mechanism.